Charles Joseph Weis was born March 30, 1956 in Trenton. He was one of five kids who grew up in Middlesex. Charlie was a member of the Middlesex High’s 1972 state champion football team. He was admitted to Notre Dame, but did not play football there. Instead he majored in speech and drama. After graduating in 1978, Charlie embarked on his coaching career with Boonton High School. From there he spent five years as an assistant at Morristown High. Charlie’s first college position came at the invitation of former Giants star Joe Morrison, the head man at South Carolina. He was a member of the Gamecocks staff from 1985 through 1988. Charlie then returned to high school coaching with Franklin High in 1989 and led the team to the state championship. At the same time, he was doing work in personnel evaluation for the Giants. Bill Parcells was impressed enough with Charlie to offer him a full-time position in 1990. He became an assistant to the offensive coordinator and special teams coach. The Giants won the Super Bowl that season. After Parcells left the Giants, Charlie coached the team’s running backs. He rejoined Parcells when the Big Tuna accepted the head coaching job for the New England Patriots. When Parcells moved to the Jets in 1997, Charlie was promoted to offensive coordinator. 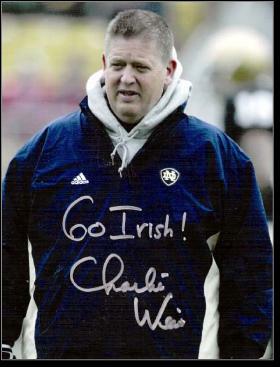 Charlie beat a path back to the Patriots after Parcells left the Jets in 1999. He served as Bill Belichick’s offensive coordinator for five seasons, ringing up three Super Bowl victories in the process. It was Charlie’s work with unknown Tom Brady that many regarded as the key to New England’s dynasty. In 2005, Charlie got his dream job. He was hired to coach his alma mater, Notre Dame. His impact was immediate, especially on offense. He turned quarterback Brady Quinn and receiver Jeff Samardzija into a potent aerial combination and led the school to a 9–3 record and a Top 10 national ranking. The following season, the Irish finished 10–3 and were ranked in the Top 20. The winning came to halt in 2007. Over the next three seasons, Charlie failed to get his team past .500. He was fired after 2009, but immediately hooked on with the Kansas City Chiefs as their offensive coordinator. The Chiefs improved from 4–12 to 10–6 and made the playoffs in Charlie’s first year. He built a potent running attack around Jamaal Charles and a revamped offensive line. After one year back in the NFL, Charlie headed back to the college football ranks. He accepted the offensive coordinator job with the Florida Gators under head coach Will Muschamp.